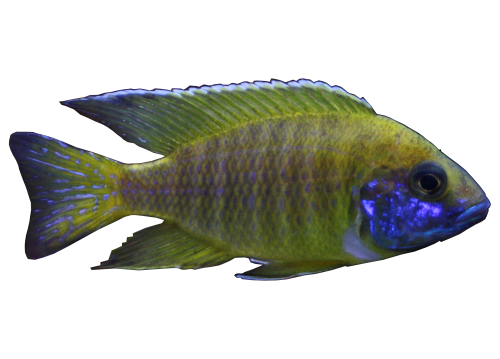 It's a small and peaceful mouthbrooder cichlid, a native of Lake Malawi in Afrika. The aquarium should be planted with thick-leaved plants that can tolerate hard, alkaline water such as Anubias and Vallisneria. The aquarium should be decorated with rocks to create hiding places. The water should be changed frequently and the filter must be maintained in full working order. They are omnivores but their diet should be mainly vegetarian. You can feed them a variety of live food, frozen and dry. They do not eat plants. Reproduction is not difficult when they are fed well. The female takes the eggs in the mouth that are fertilized by the male using the dummy egg method. The eggs are incubated in the mouth of the female for about 3 weeks. You can feed the fry with newly hatched brine shrimp.